In 1906 the General Election returned a Liberal Government with a large majority. The Liberal Party had campaigned on welfare issues. They called for reforms that would transform the way in which poverty was managed. 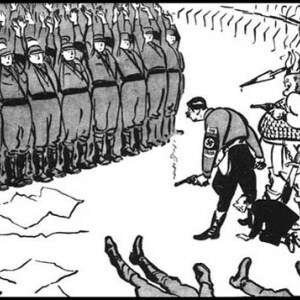 Following in the footsteps of reforms in Germany, the Liberal Reforms saw pensions, sick pay, maternity benefits and unemployment insurance for some workers introduced. The Liberal Reforms led to constitutional changes and faced criticism from both those who felt it went too far and those who wanted further reform. At this time, it the popular belief was that people brought poverty on themselves due to waste, bad habits and low morals. It was not the job of the government to help the poor – they should help themselves by hard work, thrift and saving for the future. The only help for the poor was based on the 1834 Poor Law. 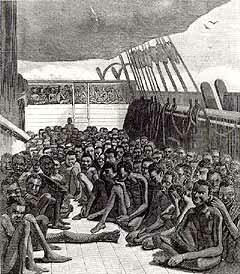 Those in need had to go into a workhouse but these were so harsh and unpleasant that most poor people did not apply. At the start of the 20th Century there was a growing belief that politicians were not doing enough to tackle the causes of poverty and that with such a high percentage of the population living in poverty Britain’s future as a great power could be threatened. The Liberal Reforms intended to raise the standards of living with this leading to improved standards in the workplace. • Charles Booth in London and Sebohm Rowntree in York carried out the first serious studies into poverty and its causes. They discovered that the causes were casual labour, low pay, unemployment, large families, illness and old age – not laziness, drunkenness and gambling. These reports raised awareness of the extent of poverty in Britain and the problems it caused. • The Boer war of 1899-1902 showed the poor state of health of the nation. One out of every three volunteers failed the army medical due to bad diet and living conditions. This could seriously affect Britain’s military strength if nothing was done to improve the situation. • The effects of poverty were damaging to society. Health problems and infectious disease could affect rich and poor. The economy suffered if large numbers of people were too poor to buy goods and social problems such as crime, prostitution, slums and drunkenness were a direct result of poverty. • There was a particular worry about the effects of poverty on children. Studies had shown many to be underweight, malformed and infested with lice scabies etc. This would lead to problems in the future – weak sickly children would become weak, sickly adults. • There were concerns about Britain’s future ability to compete with new industrial nations such as Germany and the USA. National efficiency would only increase if the health and welfare of the population improved. • The growth of Trade Unions and the Labour Party was a threat to the Liberals and the Conservatives. The new working class voters were turning to these organizations to improve their lives. The New Liberals recognized this and supported government help for the poor. • In the 1905 general election, the Liberals and the Labour Party reached agreement not to stand against each other in many seats. If elected to power the Liberals promised a programme of welfare reforms which would recognize the government’s responsibility to help the weakest and poorest sections of society. In 1906 the Liberal Government introduced Free School Meals for children. This allowed local education authorities to provide free meals to children on a means tested basis. About half of local authorities introduced the scheme and by the outbreak of the First World War some 14 million meals had been provided. In 1907 a series of free medical tests were introduced for children. as with the Free School Meals the testing was optional for local authorities. These tests identified illnesses and diseases at an early stage and marked a change in central governments attitudes towards children. They were now being seen as a national asset worth looking after. The 1908 Children and Young Persons Act provided protection for children. From now on it was a legal requirement to look after children properly and the authorities were given the power to intervene in cases where this was not deemed to be the case. Laws to stop cruelty and neglect of children and end baby farming. New Juvenile Courts no longer sent children to adult prisons. ‘Borstals’ and a probation service set up. Begging by children was made an offence. The sale of alcohol and tobacco to children under 16 years was forbidden. The Old Age Pensions Act provided a small pension for everybody aged 70 or above. As this was a universal right, rather than being means tested, it took away the stigma that had been attached to Poor Law Benefits. • Some Councils did not approve of free school meals and this had to be made compulsory in 1914. • The Children’s Charter was opposed because the government was meddling in family life. • Many people believed government help for the poor would encourage laziness. Pensions might stop people saving for their old age. • Some doctors were opposed to Health Insurance because it did not pay enough. • Friendly Societies and Insurance companies thought they would lose business. • The Tories and the House of Lords objected to the new taxes needed to pay for the reforms. • Some employers objected to paying for worker’s insurance. 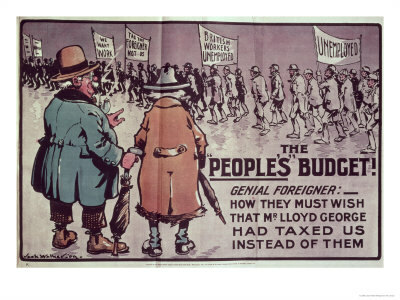 • In 1909, the House of Lords rejected the People’s Budget. 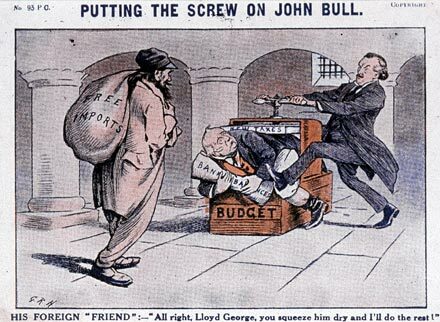 This led to the Parliament Act of 1911, which reduced the power of the Lords and stopped them interfering in money bills. • There were concerns that tax payers would have to pay for the cost of these reforms. Many thought this was unfair as the middle class tax payers tended not to need to use the “safety net” provided by the Liberal reforms. ‘Wooden floor of the upper room has holes admitting numbers of mice. Roof very defective, the rain falling through to the bed in wet weather. Outside wall also very damp. Plaster falling off. Tenants apparently clean. Courtyard houses all back to back. Water supply for 12 houses from tap placed in the privy wall. Few of the 200 families who lived there occupied more than one room. 15 rooms out of 20 were fifthly to the last degree. Not a room was free of vermin (mice or lice). The little yard at the back was only sufficient for a dust bin, toilet and water tap, which served 7 families. I warn you about the Labour Party. I warn you it will become a terrifying force that will sweep away Liberalism. We have a Liberal Parliament, but we must act to help the poor. We must get rid of the national disgrace of slums. We must eliminate the widespread poverty which scars this land glittering with wealth, otherwise the working men of Britain will vote Labour instead of Liberal. Source: From a letter Winston Churchill wrote to Asquith in December, 1908. 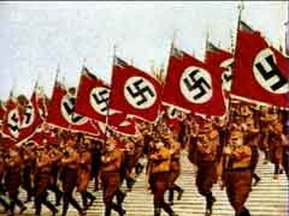 Germany is not rich as us, yet German social reforms mean they are better organised for peace and also for war. We are organised for nothing! We cannot rely on existing charities and this winter is causing misery. Consequently, there is an urgent need to help the working class and make England a safer and better country for them. When the people begin to feel the benefit of our social reforms they will give solid support to our Liberal Government. Source: Will Crooks MP, who was born in a workhouse, describes his attitude towards old age pensions. The Old Age Pension Act is just the beginning of things. We are still confronted with the more gigantic task of dealing with the sick, the infirm, the unemployed, the windows and the orphans. No country can be called civilised that allows them to starve. Starvation is a punishment that society has ceased to inflict for centuries on its worst criminals, and at its most barbarous stage humanity never starved the children of the criminal. I have had some excruciating letters piled upon me from people whose cases I have investigated – honest workmen thrown out of work, tramping the streets from town to town, begging for work, and at the end of the day trudging home tired, disheartened, and empty handed, to be greeted by faces, and some of them little faces, haggard and pinched with starvation and anxiety. During years of prosperity the workmen has helped to create enormous piles of wealth that have accumulated in the country. Surely a few of these millions might be spared to preserve from huger the workmen who have helped to create that great wealth. Source: An extract from the memoirs of Flora Thompson. At last, in 1908 the Liberal Government allocated £1,200,000 for the establishment of a non contributory old-age pension scheme, and an Act was passed to become law on 1 January 1909. BBC Bitsize. Notes and revision tests. National Archives. Use documents from the National Archives to investigate the Liberal Reforms. Defence Dynamics. Lesson plan and notes from the Ministry of Defence. Cat and Mouse Act – relates to Votes for Women but is a good contrast with the reforms.